OK not really, but I came pretty damn close to quitting between Saturday past and last night. I’ve now made peace with the fact that I look like an orca in my Xterra wetsuit [note to self… call Jason / Terry to find out if they can modify the neck so I can breeeeeeeeaaaaaaaaathe] and that there are babies – actual BABIES – with better swimming skills. But I’m working on it. And while most of my training group will strut their stuff in Clanwilliam this weekend, I’ll be staying home to work on – yes – my swimming! So I decided to take time out of my scheduled Saturday morning training to prepare for Da Chick’s 6th birthday party on Sunday. My mom visited for the weekend to help (the woman had her own baking business; she knows her stuff) and I was pretty confident that everything was under control. Got into my wetsuit, packed my stuff, then realised that I still had to drop Da Chick off at another birthday party on the way to my 4pm canal swim. So I got out of my wetsuit again, threw on a dress, ran my fingers through my hair, grabbed Da Chick, the gift and all my stuff and headed out the door. Next came the mommy gauntlet… it appeared that a lot of mommies decided to stay on at the party instead of the usual “drop n go” (wait… maybe they only drop n go with me because Da Husband and I aren’t really part of the Hout Bay Popular Parenting Club), so I made a few guilty excuses, drop-kicked Da Chick onto the jumping castle (not really, but you get the picture) and drove to the Waterfront for my swim. So far so good. Bach was playing on the radio, I was feeling cool and calm and ready for an awesome swim. I checked in, said hello to my some of my nearest & dearest training buddies, put on my wetsuit, goggles & cap and got into the water to acclimatize and relax ahead of the swim. Which is where the good vibes ended. Because 30 metres in I started wheezing and suffocating and treading water. Coach Steve, snugly wrapped in a furry coat (hope it was faux) shouted at me from the side. As much as I tried to I didn’t get very far. Something had my chest in a vice grip. My breathing consisted of short gasps in and wheezing out. I cried a bit on the way back to the start point, then pretended that my goggles had fogged up and cleaned everything before finding the nearest steps to get out of the water. When I got back to the Victorious Ones, jubilantly splashing about and cracking jokes after their swim, I helped Sofie out of the water and had another very unladylike snotty little cry. Anyhoo, I got back in the car, still feeling like a loser, and drove back home. And had to stop twice for an ugly cry, convincing myself that I was not in any way ready to race in January. When I got home my mom had more bad news: my rainbow cake – all six layers – had flopped, and I had to start baking from scratch. After throwing a tiny tantrum and locking myself in the bathroom for the third ugly cry, I came out, chatted to my friend Amore who came to drop off her daughter for a sleepover and started baking again. Last night we gathered at the-place-formerly-known-as-La-Med for some track and speed work. 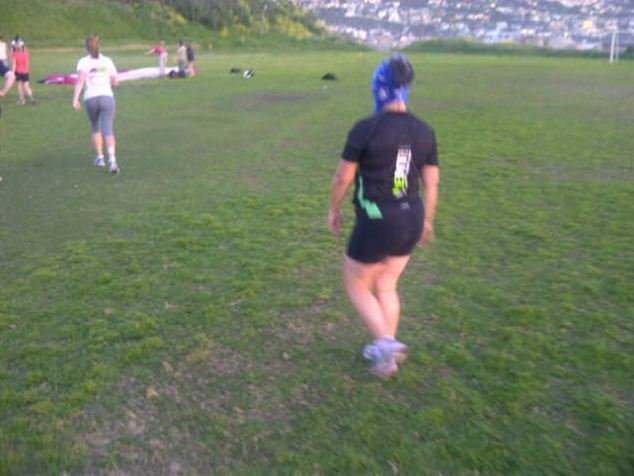 Our mission: to do 10 x 400m sessions at our individual 10km race pace target. As Steve shouted out target times and corresponding 400m lap times, I realised that my 10km time target didn’t even exist on his sheet. The only comforting thought I could hang onto was that we would have 1 minute 30 seconds rest before the next 400m lap. What I didn’t know was that the rest period would kick in BEFORE my actual finish, which only gave me about 10 seconds’ rest in between each lap. Then I took off my shoes, ran lap 10 barefoot and shaved 10 seconds of my previous four lap times!! “I quit!” I thought on the way back to my car. “I quit!!! !” I told myself on the way back home. “I take my hat off to you,” said my best friend Tania when I got home and told her about my session. And I realised that everything was going to be alright.